Great review of one my favorite films. 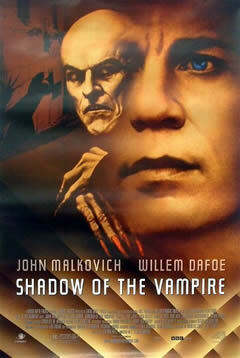 Willem Dafoe is amazing in his portrayal of Max Schreck - the vampire. What an ingenious screenplay! I know a good number of people who didn't care for this movie - and I could never understand why. It's fun to watch Nosferatu (1922) back to back with Shadow of a Vampire (2000) to see what a remarkable job that Elias Merhige did with this film. @Klaus: Thanks so much. Here's another movie I was lucky enough to catch on the big screen when it was first released. I saw it with a friend from work, and we were both very impressed with Dafoe and Malkovich, as well as the film's use of humor ("You will have no closeups! ZERO!"). Merhige does do a wonderful job recreating NOSFERATU, and the story twist itself is second to none. I really enjoyed watching Cary Elwes a British actor doing German accent in this film. It was professional.